Here’s the video. Note: it comes with political commentary, which we have nothing to do with. We just thought the video itself was funny. Everybody has their own opinion on the Israel/Palestine debate, but we can all agree that sometimes soldiers need stress relievers, no? The video has turned into a PR problem due to the sensitive nature of the situation in Hebron. 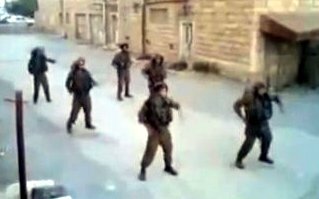 YNet news reports that the soldiers involved in the video face possible disciplinary measures. Hebron is one of the most volatile cities in the West Bank. 600 Israeli settlers live there among thousands of Palestinian Arabs.